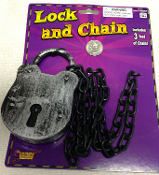 Fun realistic metallic look silvery gray and black fake hollow plastic Jumbo Lock with Chain accessory set is a great Halloween prop decoration for dungeon, witch trials, haunted house jail scene, graveyard cemetery, bachelor or bachelorette party gag gift, or Convict, Prisoner, Inmate, Jailor steampunk cosplay costume accessory. Injection Mold Hollow Plastic Faux Padlock measures approx. 5-inch (12.5cm) high x 3-inch (7.5cm) wide x 1-inch (2.5cm) deep. Black plastic chain measures up to 3 feet long. Chain links approx. 1/2-inch wide.